Breakups are hard. Public breakups are even worse, but public breakups where there was some initial bad blood between the figures involved are even trickier to navigate. This is where Calvin Harris found himself after his high profile split with Taylor Swift, which he talks about in his new GQ UK interview. "It was completely the wrong instinct. I was protecting what I see as my one talent in the world being belittled. It felt like things were piling on top of me and that was when I snapped. It's very difficult when something I consider so personal plays out very publicly. The aftermath of the relationship was way more heavily publicized than the relationship itself. When we were together, we were very careful for it not to be a media circus. She respected my feelings in that sense. I'm not good at being a celebrity. But when it ended, all hell broke loose. Now I see that Twitter thing as a result of me succumbing to pressure. It took me a minute to realize that none of that matters. I'm a positive guy. For both of us it was the wrong situation. It clearly wasn't right, so it ended, but all of the stuff that happened afterwards..."
For some context, after word came out that Taylor had been involved in Calvin and Rihanna's hit "This Is What You Came For," the producer tweeted out his frustration at what he saw as TSwift's post-breakup PR strategy. But the two have been reportedly friendly for some time now, even casually texting. 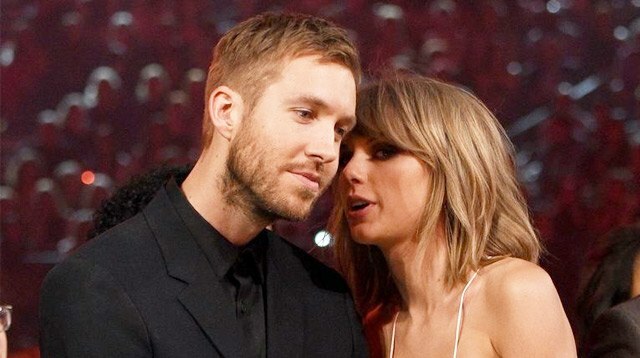 Now, Calvin's making wild money and wild music videos with Katy Perry, while TSwift is dating another Brit (actor Joe Alwyn) and uh, congratulating NBA MVP Russell Westbrook. Everybody wins!